I moved to South Central Los Angeles almost 20 years ago with a 9-year-old and a baby, and, as I went about raising my two children, I was immediately struck by the scarcity of stores selling affordable, healthy food. Fortunately, I had an alternative. I was able to buy produce in the neighborhood from a truck that stopped by once or twice a week and sold papayas, mangos, melons, cucumbers, coconuts, corn, and whatever else was in season in Mexico (where I understood the produce to be coming from). It was a simple, flatbed truck. 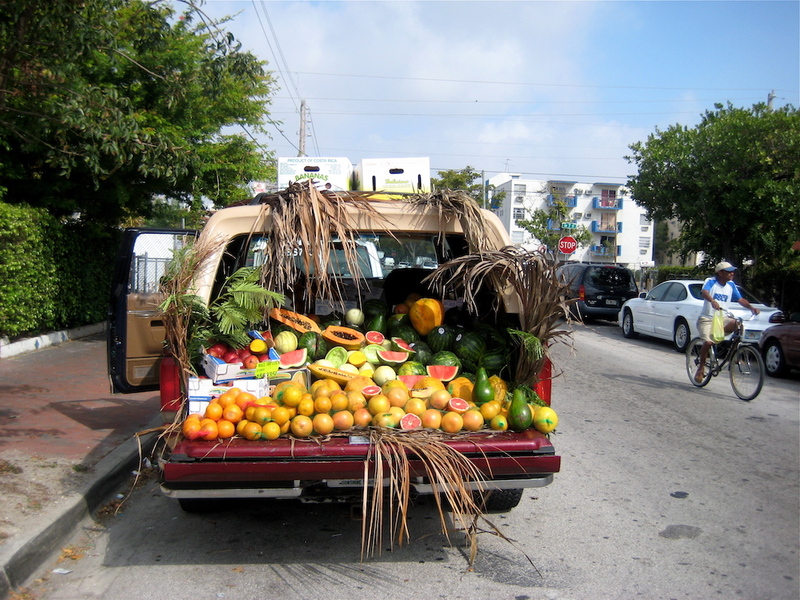 The driver picked up the produce right before driving around different neighborhoods and selling it until the truck was empty. The fruit and the vegetables were delicious and affordable, though I had no way of knowing how they were grown. As a busy mother raising two young kids, this was a valuable resource for me. And I found myself wondering if there were other outlets like this in the area and if there was any way to become aware of them. The dominant narrative around food in South L.A. is that there are few healthy options here and too much junk food. But I learned from experience that the narrative failed to include local responses to the issue, including the weekly produce truck. And because of this major omission, the potential solutions being offered to South L.A.’s food challenges dwell far too much on people or institutions coming in from outside the region. Through my local volunteer work, I eventually become involved with Community Services Unlimited (CSU), a South L.A.-based nonprofit that creates community programs and supports organizing efforts in many areas, including building access to good food. 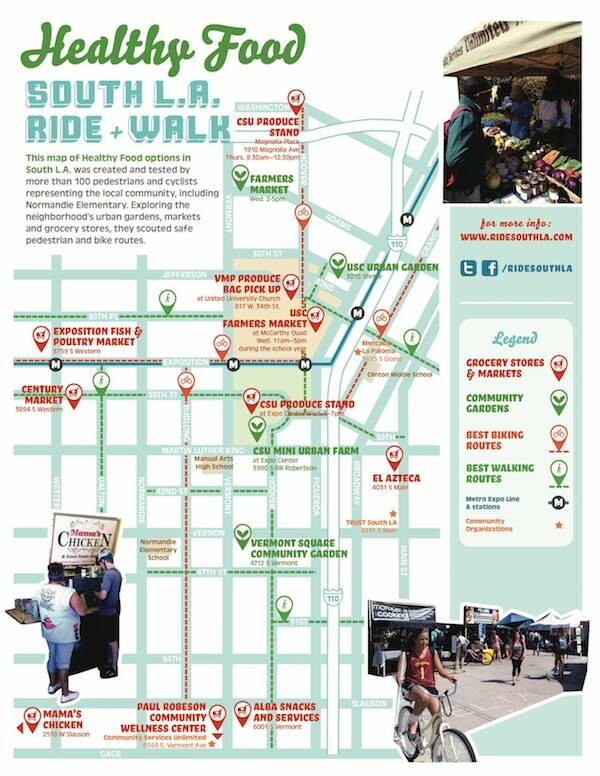 In 2012, CSU partnered with TRUST South L.A. and the Annenberg Innovation Lab at USC to create a biking and walking map of healthy food outlets in South L.A. I became part of the mapping project, first by brainstorming with my colleagues about how best to utilize the skills in the neighborhood to create this map. I was also one of the team members that led the first community walk using the map. As a tour guide, I pointed out both the community-driven spaces where good food is available and the many deficiencies that still exist—including the disparities inherent in the development of food outlets around USC and the lack of food outlets in the neighborhoods surrounding it. This was an important project for many reasons. We wanted to document that there are in fact places in the neighborhood where healthy fare is available, and to share that information as widely as possible. We wanted to encourage biking and walking, initially by organizing bike rides and walks that used our map. And we were eager to engage local residents in thinking about mapping as a tool to create change. A map for healthy food options in South L.A.
CSU had a longstanding program at a local elementary school, Growing Healthy, that worked with students to create and manage on-site growing areas and build students’ knowledge of food systems and how to change them. So students from the Growing Healthy program at Normandie Avenue Elementary School helped make the map. The students received hands-on training in mapping and its multiple potential uses. As local residents who regularly moved around in the neighborhood, they knew the local streets and made important contributions to the first drafts of the maps, which were then shared with the wider community for input. Our most important goal in producing and distributing these maps was to show that solutions to the food access issue were emerging from the community. This meant striking a balance. While being careful to note that the problem of food access remains and more work must be done, we also pointed out that South L.A. residents themselves are not passively sitting by and waiting for the answers. That’s why the map includes places like Mama’s Chicken, a corner store near Slauson and Fourth Avenue whose owner makes it a point of pride to sell produce and other healthy foods. The map has been a useful tool in ongoing food access work in the community, but the frustration of getting policymakers, academics, and media commentators to understand and acknowledge community-driven solutions remains. Outsiders still largely focus on potential solutions that come from outside the community, despite the progress of CSU and other like-minded local organizations. That focus on outside saviors has real costs. For example, even with all the promises made to South L.A. since 1992 about food, the area has seen a net decrease in produce markets, as one Occidental College study demonstrated. Elected officials have wasted decades trying to convince wealthy supermarket chains like Ralphs or Trader Joe’s to open markets, often by dangling public monetary incentives. The most recent fiasco involved our city giving two acres of land and $750,000 to a private developer to create a South L.A. market—and that developer walking away when asked to build the store so it would not look like a concrete block. Public incentives to support small-scale local initiatives have a proven impact. Just one example is Mandela Foods Co-op, a worker-owned co-op serving West Oakland, a community very similar to South L.A., which is about to celebrate its seventh anniversary. We already have similar initiatives in place in South L.A. CSU began building our local food social enterprise, the Village Market Place, in 2007 (it has also started a side project to use excess food at South L.A. urban farms). In that first year, we served 15 local families with fresh food. By the end of last year, we were serving 9,000 local families annually. The growth of this business is only limited by our capacity. In July 2015, CSU purchased a 10,000-square-foot lot at Vermont Avenue and 66th Street that we are developing into South L.A.’s first organic market and café, along with an onsite farm. Why are the public dollars not offered to projects like these with the same ease that money is thrown at private investors? The map is now three years old, and it’s still growing and inspiring people. At CSU, we use it to share news of our existing local healthy food outlets, and to encourage physical activity through walks and bike rides. The map and other community-generated mapping projects make good starting points for teaching young people about community-driven research and how it can help make meaningful change. The youth in our From the Ground Up program have organized their own community bike ride and are working on an extension of the healthy map that will cover neighborhoods as far south as Manchester, with Vermont Avenue as a central corridor. Along with partners, we are beginning to think about ways to leverage our market development projects to impact broader development along the Vermont corridor (and, vice versa, how this development can help the market). Meanwhile, we remain committed to mapping the small but crucial community outlets like my old favorite food truck. Neelam Sharma is now executive director of Community Services Unlimited Inc. You can follow it on Facebook (@CSUINC), Twitter (@CSUINCLA), and Instagram (@csuinc). *Lead photo courtesy of Chris Goldberg/Flickr. Interior image courtesy of Neelam Sharma.